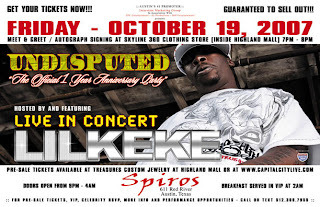 From the Bavu's list of shows department... Lil' Keke, from the Southside, when was the last time you had this classic on... performing @ Spiro's this Friday, Oct. 19th. Tix are $20 presale here. Damn... I need some sleep... my eyes are no longer slanted because I'm Asian. Lil' Keke (born Marcus Lakee Edwards on March 31, 1976) is a rapper from Houston, Texas who is an emcee and member of the Screwed Up Click. He also became one of Houston's most visible rappers, releasing solo albums for Jam Down Entertainment. Lil' Keke has become a well known rapper in Houston and continues to record albums annually. His song Southside was a success in 1998. In 2006, he came out with his single "Chunk Up Tha Deuce" which features Paul Wall and UGK. He currently is signed to Swishahouse Records.